Photo: Fur & Feather. Cats: Show and Pet (1903) by C.A. House. Courtesy of The Harrison Weir Collection. Silver Classic Tabbies have always appealed. By value of the contrast between their clear silver ground colour and their deep black markings, they are naturally 'showy', drawing attention to themselves. This is even more-so the case in shorthaired cats, but the longhaired varieties have also highly prized and appreciated, but it is naturally more difficult to produce a clear pattern when it is dispersed through a long coat which tends to move and alter with the natural movement of the cat. Although there have been a great many successful silver tabby shorthairs, the first of wide repute was Mrs. 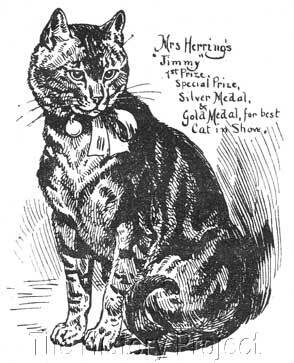 Herring's 'Champion Jimmy', born in 1890, who carved an enviable reputation for himself and who fortunately left behind, an excellent spread of his genes in both male and female progeny. It was in fact, the great catalogue of successes enjoyed by 'Ch. Jimmy' and his sister 'Ch. Laurel Queen' (owned by Charles Lane), that helped to establish a strong contingent of early shorthair fanciers, who wished to duplicate their winning ways. The next cat to begin duplicating this success was Mrs. Collinwood's 'James II', who accumulated an enviable record of wins in record time. 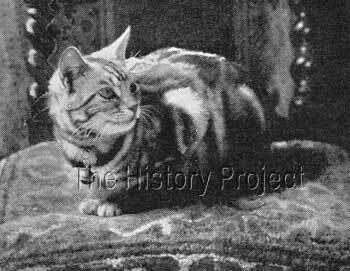 'James II' was also a prolific producer, and from him were descended several more generations of Silver Tabbies, on both sides of the Atlantic, establishing him as one of the prime progenitors of the Silver Tabby Shorthair in both the United Kingdom and the United States. In Volume 1 of The Cat Fanciers' Association Stud-Book, under the registration of his son, 'Pretty Correct', we find that 'James II' has by this time been given a National Cat Club registration number (NCC: 4742). We have no official record of his breeder, but if his dam was indeed Mrs. Newlands 'Rose' we can find another male named 'Jim Shelley' (NCC:3321) born in 1895, whose breeder of record is Mr. E. Newland. It seems a little more than coincidence that this male also shares the name 'Jim' and that 'James II' may in fact have been from a repeat breeding. So while our 'James' only may have been bred by Mr. Newland, there is no doubt that his first owner of record was Mrs. Leuty Collins. 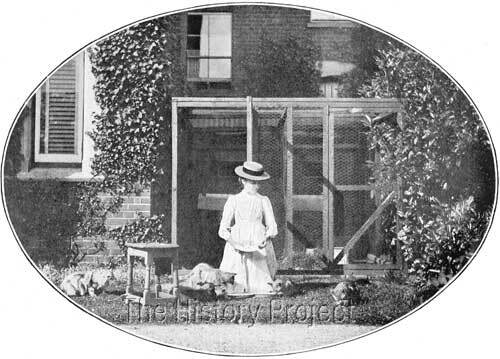 She appears as his owner in The Cat Club Register, where the transfer of ownership of 'James II' is recorded between Mrs. Leuty Collins and Mrs. Collingwood. Two images of Mrs. Herring's 'Champion Jimmy', sire and name-sake of Mrs. Collingwood's 'Champion James II'. Jim is quite the pet of the establishment, and has the free run of the house. He appreciates the comfort of the kitchen fire, and always sleeps at the bottom of his mistress' bed. 1st, Slough, 1901; 1st Brighton, 1901; 2nd, Reading, 1901; 2nd, Manchester, 1901; 2nd, NCCC Show, 1902; 1st Harpenden, 1902; 1st and Championship, Edinburgh, 1902; 1st and Championship, Botanic, 1902; , Altrincham, 1902; 1st and Special for Best Cat in Show, Crystal Palace, 1902; 1st and Special for Best Cat in Show, Cheltenham, 1902; 1st, Championship and Special for Best Short-hair Cat in Show, Midland Counties Cat Club Show, 1902; 1st and Championship, Northern Counties Cat Club Show, 1903; 1st and Championship, Harrogate 1903; 1st Sandy, 1903; 1st and Special for Best Short-hair Cat, Glasgow, 1903; 1st and Special for Best Cat in Show, Cheltenham, 1903; 1st and Special for Best Cat in Show, Brighton, 1903; 1st, Midland Counties Cat Club, 1903; 1st, Crystal Palace, 1904; 1st Sheffield, 1904; 1st Southampton, 1905; 1st Sheffield, 1905. "His wins have been made under the following judges: Mrs. Mackenzie-Stewart, Miss Cochran, Miss F. Simpson, Sir Claud Alexander, Messrs. Louis Wain, Gresham, Mason, House, Ambrose, Roberts, Woodiwiss, Welburn, Lane, and Young." This stunningly marked Silver Tabby was only naturally highly sought after by other breeders as a potential mate for their queens. So much so, that Mrs. Collingwood received so many requests for his services that she reconsidered her original stance, not to have him standing at stud. Accordingly the following announcement appeared in the editorial columns of 'Our Cats' on 5th September, 1903. A morning meal at 'Bossington'. 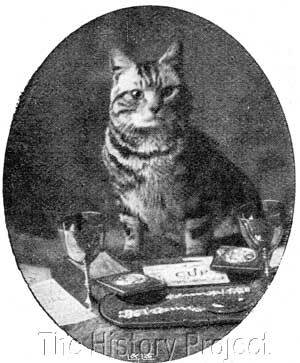 'Dame Fortune', Silver Tabby Shorthair female, bred and owned by Mrs. Mellor Bonny (MCCC 1903). Dam of many successful breeders, among them, 'Dame Fortune II', sired by 'Sweet William', and 'Dame 'Dame Fortune III', sired by 'Silvester'. 'Dame Fortune II', was bred by Miss Bonny and exported to Mrs. J. Cathcart (USA) (ACA:501)(ACA v2). 'Dame Fortune III' was bred and retained by Mrs. Mellor Bonny. 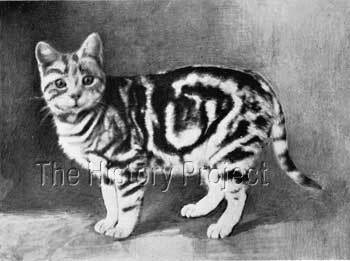 (Litter born 2nd May, 1903). (Litter born 1st July, 1903). (Litter born 28th April, 1904). (Litter born 21st May, 1904). (Litter born 12th June, 1904). 'My Bubbles', Silver Tabby Shorthair female, bred by Mrs. Collingwood and owned by Mrs. Roch. (OC: 10/Dec/1904). 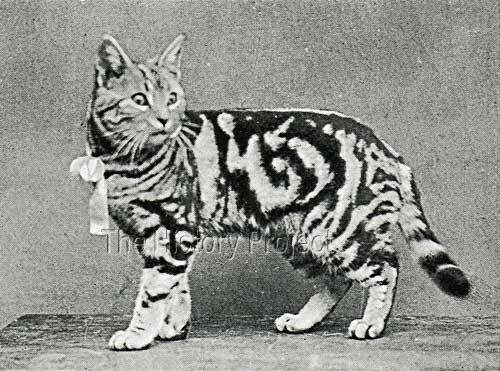 (Litter born 20th April, 1905) (Father/Daughter breeding). All bred and owned by Mrs. Collingwood. 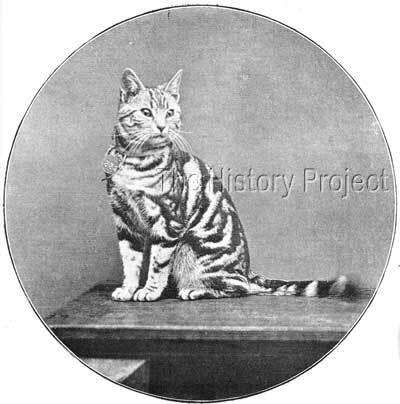 'Holmefield Tabby Boy', (aka Holmefield Silver Tabby Boy), Silver Tabby Shorthair male, bred by Mrs. Chivers and owned by Mrs. E.T. Moore. (MCCC:1905), later owned by Lady Decies and renamed 'Fulmer Tabby Boy'. (NCC:5810) As 'Holmefield Silver Tabby Boy', he was the sire of 'Silver Prince Fortunatus'(ACA:502) out of 'Dame Fortune II', (ACA:501). 'Silver Prince Fortunatus' was bred by Mrs. Bonny and exported to Miss J.Cathcart (USA). (Litter born 28th October, 1905). 'Pretty Correct', Silver Tabby Shorthair male, bred by Mrs. Collingwood and exported to Miss J.R. Cathcart (USA). (CFA:18)(CFA v.1). 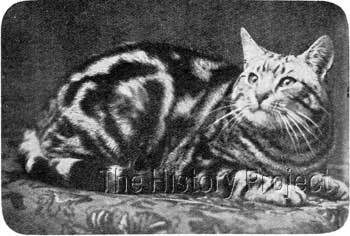 'Silver Stripes', Silver Tabby Shorthair male, bred by Mrs. Collingwood and exported to Miss J.R. Cathcart (USA). (ACA:424)(ACA.v.2). 'Silver Stripes' was the sire of the magnificent 'Genesee Valley Jane', whose dam, 'Dame Fortune II' was also a grand-daughter of 'James II'. 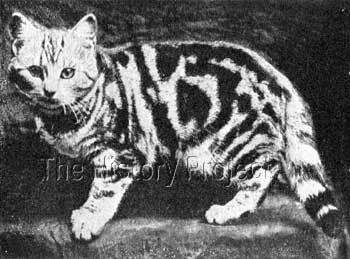 'The Buzzing Silver', Silver Tabby Shorthair female, bred by Mrs. Collingwood and exported to Mrs. J.C.Mitchelson (USA). (ACA:4129) (ACA v2). (CFA:312)(CFA v1). (Litter born 22nd October, 1906). (Father/daughter breeding). In many ways, 'James II' falls into a special category of his own as the progenitor of so many lovely silver tabbies registered in both the United Kingdom and the United States. 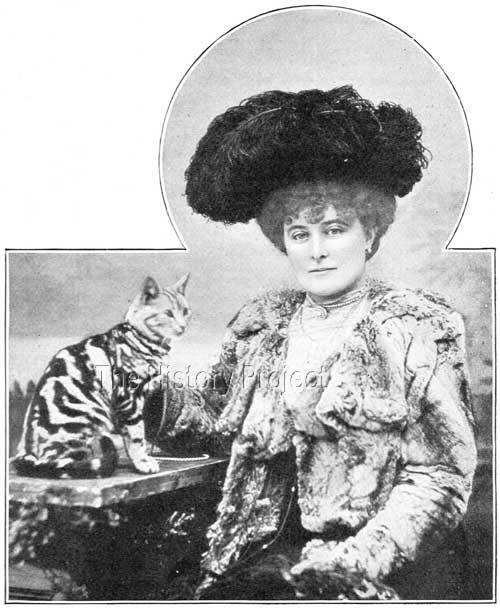 His was a lasting legacy, with the early and spectacular arrival of his progeny such as 'Miss Toodles' making a grand entry into the show scene as a winning kitten in England in 1903, and later, his grand-daughter/great grand-daughter 'Genesee Valley Jane' having a similarly spectacular entry into the show scene in the United States in 1908. Other sons and daughters in both countries would carry his bloodlines into succeeding generations making him an early foundation cat for the British Shorthair and their American-bred counterparts, long before their breed names were even established. Through his own heritage, he connects his progeny to the originating silver line that began with Mr. T. Sugden's "King of the Fancy". But none of this would have been possible had it not been for the intervention of Mrs. Collingwood. It was she who, after obtaining 'Jim' from Mrs. Leuty Collins, campaigned him so successfully and then carefully selecting his future mates. Mrs. Collingwood consistently produced some of his best early progeny, ultimately sharing the lines with the incomparable Miss Jane Cathcart in the United States, who was careful to accumulate a bevy of sons, daughters, grandsons and grand-daughters, in order to preserve the availability of the lines and the distinctive pattern held within that gene pool. That 'James' was able to enjoy such a natural and happy home life, while also being a much-admired show specimen presented in prime condition, and producing an array of spectacular progeny, must be attributed to Mrs. Collingwood's excellent management and great care. It is a reminder to us that a healthy, top show and breeding cat, should always be, first and foremost, a much-loved and appreciated pet. Our Cats Magazine, 12th September, 1903. Our Cats Magazine, 5th September, 190.